WASHINGTON (AP) — Federal Reserve Chairman Ben Bernanke began Wednesday to outline the central bank's strategy for reeling in stimulus money once the economic recovery is more firmly rooted. Bernanke said the Fed will likely start to tighten credit by boosting the interest rate it pays banks on money they leave at the central bank. Doing so would raise rates tied to commercial banks' prime rate and affect many consumer loans. Companies and ordinary Americans would pay more to borrow. Bernanke's remarks on the Fed's eventual pullback of economic aid come amid signs that the global recovery remains fragile. Europe is trying to contain a debt crisis. And President Barack Obama is pushing for tax breaks to generate jobs. But in his prepared remarks to a House committee, Bernanke indicated the Fed is still months away from raising rates or draining most of the stimulus money it injected to rescue the financial system. He said the recovery still needs support from record-low interest rates. The Fed chief used his remarks to explain how the central bank will try to withdraw the stimulus money without tipping the economy back into recession. Using the rate it pays on banks' excess reserves to affect credit would be a new strategy for the Fed. Since the 1980's, its main lever to tighten or loosen credit has been the federal funds rate. That is the rate banks charge each other for loans. It's now at a record low near zero. The rate paid on banks' excess reserves is 0.25 percent. Boosting that rate would give banks an incentive to keep money parked at the Fed, rather than lend it. It also would cause the funds rate to rise, economists say. Adjusting the interest paid on banks' excess reserves helps stabilize the funds rate when the financial system is awash in cash, as it is now. Paying interest on the reserves is a relatively new tool for the Fed, having been authorized by a 2008 law. Many foreign central banks rely on it. The Fed started paying interest on the reserves at the height of the financial crisis in October 2008. In his prepared remarks to the House Financial Services Committee, Bernanke lays out his most extensive details to date on the Fed's exit strategy from record-low rates and economic stimulus. Under the threat of a major snowstorm, the panel postponed its hearing scheduled for Wednesday. The hearing was intended to review the Fed's plans for withdrawing its emergency supports. 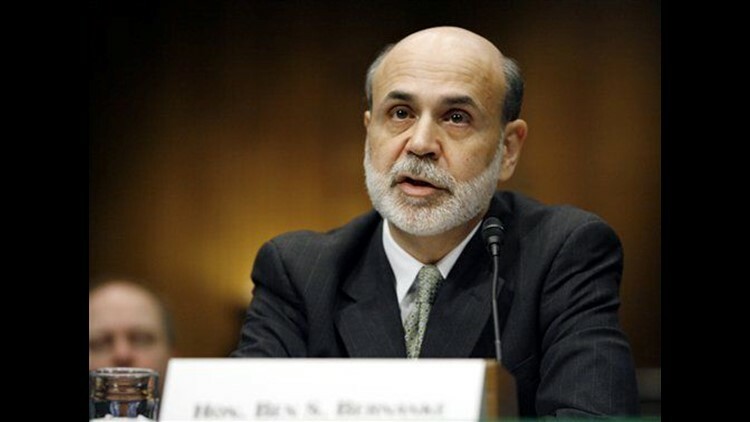 Bernanke chose to release the prepared testimony, given the interest of investors and others. Deciding when and how to remove all the stimulus is the biggest challenge for Bernanke in his second term, which started last week. Reeling in the stimulus too soon risks short-circuiting the recovery. That could send unemployment up. Yet the Fed keeps its stimulus measures in place for too long, they could help unleash inflation. Bernanke repeated the Fed's pledge to hold rates at record lows for an "extended period." Economists think that means for at least six more months. But Bernanke cautioned that the Fed eventually will need to raise rates to ease inflationary pressures. Even before the Fed raises the rate paid on banks' excess reserves, it could raise the rate it charges banks for emergency loans, Bernanke said. That rate, called the discount rate, is 0.50 percent. An increase in the discount rate wouldn't affect interest rates charged to consumers and businesses. But Bernanke said it would help normalize the Fed's interest rate policy now that the worst of the financial crisis has passed. He said he expected the Fed to consider a "modest" increase to the discount rate. Such a move would not raise rates for households and businesses and would not signal any change in interest-rate policy, Bernanke said. The Fed is still weighing the order of steps it can take to reel in the stimulus. Under one scenario, the Fed would first use its tools to drain money from the financial system. Then it would start pushing up rates throughout the economy by boosting the rate paid on banks' excess reserves, Bernanke said. But if a faster exit is needed, the Fed could raise the rate on reserves even as it's using its other tools to pull money from the financial system. The Fed is fine-tuning one tool to withdraw money: By selling securities from its portfolio with an agreement to buy them back later. Those operations are called reverse repurchase agreements. And the Fed is moving ahead on a proposal to let banks to set up the equivalent of certificates of deposit at the central bank. This, too, would help the Fed mop up money pumped into the economy and prevent inflation from flaring later. Together, those two operations — reverse repos and the CD-like deposit accounts — would let the Fed "drain hundreds of billions of dollars of reserves from the banking system quite quickly, should it choose to do so," Bernanke said. Bernanke said he doesn't expect the Fed to sell any of its securities anytime soon. To fight the financial crises, the Fed pumped so much money into the economy for lending programs that its balance sheet swelled to $2.2 trillion — more than double the pre-crisis level. The Fed will need to mop up that money to prevent inflation later. Bernanke said another economic support program aimed at driving down mortgage rates and bolstering the housing market is on track to end in March. By then, the Fed will have finished buying $1.25 trillion in mortgage securities from Fannie Mae and Freddie Mac. It will also have finished buying $175 billion in debt from the mortgage giants. But the Fed hasn't ruled out continuing to buy mortgage securities after then to support the economy.